Based on the popular M4 rifle used by the United States military and its allies abroad, the G215 takes ergonomics, reliability, and accuracy to the next level. 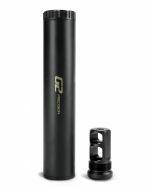 The match grade barrels come with a Crux flash hider and are threaded to accept a suppressor. Optics and Accessories NOT Included!